Trails are open, the South trails were groomed before Christmas and remain in good shape. Packed with rough spots. There are two hazards that have been flagged for your safety so please ride with caution! The north trails have not been groomed yet but we are working on getting the groomer hauled out to the North side this week but will likely not start filling creeks in until next week. 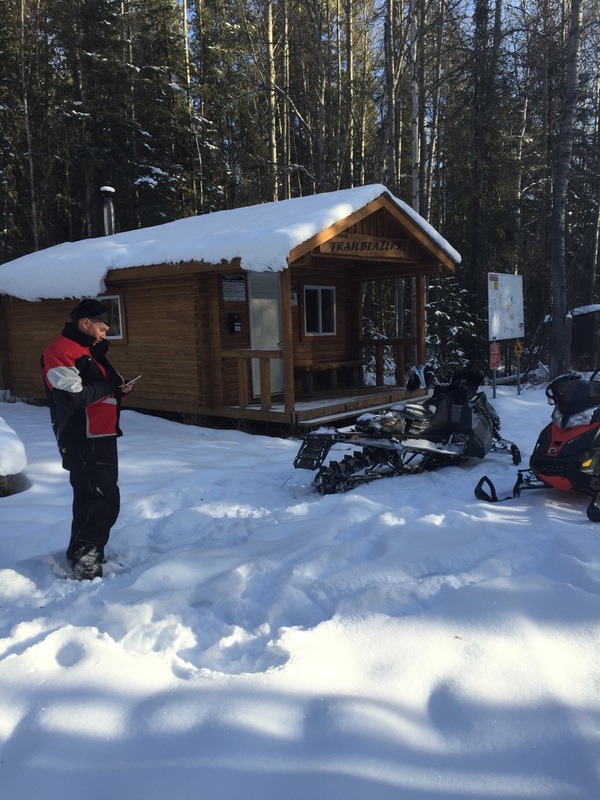 Currently we do not advise travel on the trail to Gundy cabin due to unexpected trail conditions through Huestis Forest. The trail was plowed down to the road for about 3-4kms, we are currently talking with the Huestis group to find a solutions. The South Groomer is going out today!!! It has been deemed that the snow we received over the weekend should be enough to go and fill in creeks. The groomer will be filling creeks over the next couple days. So if you are planning on riding in the south please drive with caution and watch for the groomer. If you are riding on any of the trails please carry a small folding hand saw, this way you can help us out by trimming any leaners or branches that have fallen on the trail. If you do come across a large tree down on the system please try and flag it if you can, if you could also record the GPS location of the tree we will send someone out with a large saw to take care of the tree. You can use your phone to get the GPS location by dropping a pin and emailing it to president@whitecourttrailblazers.ca. GPS coordinates are a must so that we do not have someone going out to cut a tree by the summit cabin when it was really the Carson cabin that the tree was down at. Please ride responsible and go out and enjoy yourselves! Trail conditions are looking up! New snow has improved trails in the area. Snow is still a little thin but reports of 18-24″ of snow in the bush. Trails are packed and are a tad rough. There is not quite enough snow for us to send the equipment out to groom yet but we hope to soon! Please use Extreme Caution when crossing water including rivers, lakes, ponds and streams. Some of these smaller water spots may look frozen but may have rotten ice due to the recent warmer weather. The trail behind Millar Western has eroded to the point of not being able to get the groomer through this season. 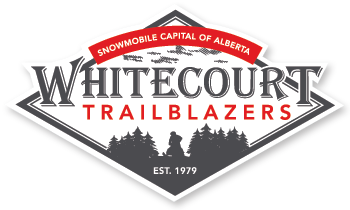 A meeting was held between the Town of Whitecourt, The Whitecourt Trailblazers and Miller Western and it was decided that the trail will be closed for the season. This is due to the erosion and the unpredictable way the river is eroding the bank at this spot. We apologize for the inconvenience but it was deemed a hazard that could not be contained. The Town and the Trailblazers are discussing possible other routes from downtown to the trail system, and we will keep you updated as a solution is found. Don’t forget you stocking stuffers!! Pick up a trail pass or raffle tickets for a sledder in your life today!! CONGRATULATIONS WHITECOURT – WE DID IT!! We broke the Guinness World Record for the Largest Snowmobile Parade of 1047 Snowmobiles, last February with the ASA World Snowmobile Parade. 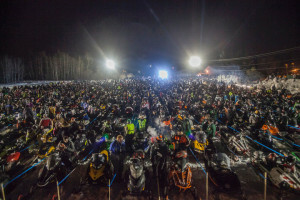 Thank you to the Alberta Snowmobile Association, ASA Club Members who participated, Out of town riders and local riders. Due to the lack of any new fresh snow the trails in the south are currently in poor condition. With many dirt spots, rough and uneven spots. Travel to the south is not suggested until we get some more snow. Trail Conditions on the trails north of town are listed as fair condition. The north received more snow in the beginning and is now in better shape because of it. Caution is still advised with the early snow conditions there are still a lot of leaning trees and weak trees along the trail that could fall with more snow. Trails may be rough and unpredictable given the low snow. Final Preparations are being made on the Snow Grooming Equipment, grooming will not start until we receive more snow. The non-groomed trails are officially open. Warm weather expected for the next week. Snow is better on the north and west trails. The south trails have many hazards existing on the trail (not enough snow), it is recommended to stay away from the Summit area. Both staging areas are open. PLEASE RIDE WITH CAUTION. Caution is still advised with the present snow conditions, leaning and weak trees exist on the trails. Trails may be rough and unpredictable given the low snow. Please use extreme caution when crossing water areas including rivers, lakes, ponds and streams. We will groom when we receive more snow. The Trail behind Millar Western is not passable, please do not use. Don’t forget to get your trail/day passes. $70 before January 1, 2016, after $80. Enjoy the warm weather. It sure isn’t helping to keep snow. We need snow like they are getting in Whistler the next 7 days 55-115″.